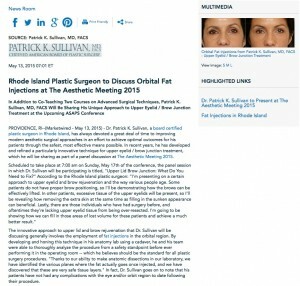 Rhode Island Plastic Surgeon to Discuss Orbital Fat Injections at The Aesthetic Meeting 2015 - Patrick Sullivan, M.D. In addition to co-teaching two courses on advanced surgical techniques, Patrick K. Sullivan, MD, FACS will be sharing his unique approach to upper eyelid / brow junction treatment at the upcoming ASAPS conference. Providence, RI — Dr. Patrick K. Sullivan, a board certified plastic surgeon in Rhode Island, has always devoted a great deal of time to improving modern aesthetic surgical approaches in an effort to achieve optimal outcomes for his patients through the safest, most effective means possible. In recent years, he has developed and refined a particularly innovative technique for upper eyelid / brow junction treatment, which he will be sharing as part of a panel discussion at The Aesthetic Meeting 2015. The innovative approach to upper lid and brow rejuvenation that Dr. Sullivan will be discussing generally involves the employment of fat injections in the orbital region. By developing and honing this technique in his anatomy lab using a cadaver, he and his team were able to thoroughly analyze the procedure from a safety standpoint before ever performing it in the operating room – which he believes should be the standard for all plastic surgery procedures. “Thanks to our ability to make anatomic dissections in our laboratory, we have identified the various planes where the fat actually goes once injected, and we have discovered that these are very safe tissue layers.” In fact, Dr. Sullivan goes on to note that his patients have not had any complications with the eye and/or orbit region to date following their procedure. In addition to participating in the panel discussion on Sunday, May 17th, Dr. Sullivan will also be co-teaching two courses at The Aesthetic Meeting 2015 later that day. Titled “Aesthetic Eyelid and Forehead Surgery that Focuses on a Natural Result for the Patient”, the first course is scheduled to take place from 2:00 pm to 4:00 pm. The second course – titled “Advanced Techniques for Rejuvenation of the Neck and Lower Face” – is set to occur from 4:30 pm to 6:30 pm. Hosted annually by the American Society for Aesthetic Plastic Surgery (ASAPS), this year’s conference is scheduled to take place at the Palais des Congrès in Montréal, Quebec, Canada from May 14th to May 19th. Plastic surgeons traveling from all over the world will gather to present, discuss, and learn about inventive approaches to resolving some of the most challenging issues present in aesthetic surgery today, all in an effort to enhance patient care worldwide. Dr. Sullivan is certified by both the American Board of Plastic Surgery and the American Board of Otolaryngology. Voted by his peers as a top plastic surgeon in Rhode Island, he is renowned for his skill and expertise in aesthetic surgery of the face, breasts, and body. Among many honors and recognitions, Dr. Sullivan has been named in the top one percent of plastic surgeons in America by U.S. News & World Report, and Castle Connolly has distinguished him as one of “America’s Top Doctors”. He is available for interview upon request. For more information, visit www.drsullivan.com.